When required, a National Insurance Number Verification Request (NVR) can be submitted through the RTI utility in BrightPay to HMRC, in order to verify or obtain a National Insurance number for one or more employees. 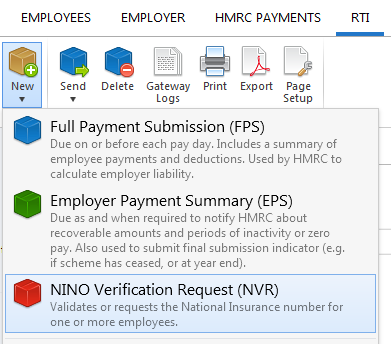 To send an NVR to HMRC using BrightPay, simply select 'RTI' on the menu bar. 2) Select the employees who you wish to include in the NVR. The contents of the NVR will be displayed on screen. The NVR can be printed or exported at any time before or after its submission to HMRC by clicking 'Print' or 'Export'. 3) When ready to submit the NVR to HMRC, click 'Send Now'. 4) Confirmation details will subsequently appear on screen to indicate that your submission has been accepted by HMRC. 5) Should your submission fail, simply click on the 'Details' button for more information on why your submission has been rejected by HMRC and correct your employee information where required. Once the NVR has been submitted, HMRC’s subsequent response can be viewed through your HMRC PAYE Online utility, which will tell you if the number is right or wrong, or will provide a National Insurance number if you haven't got one.